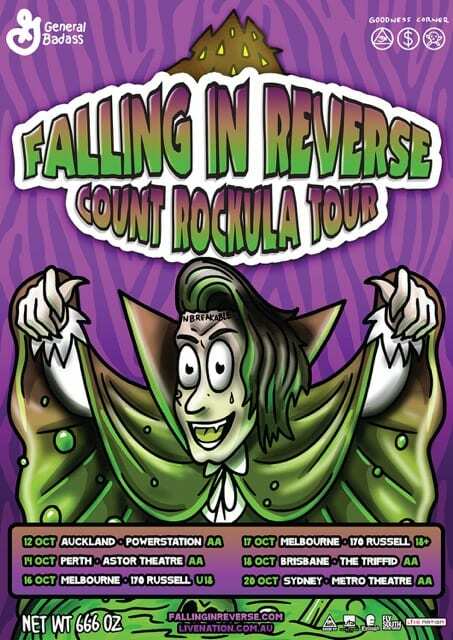 One of the most talked about, controversial and adored rock bands of our time, Falling In Reverse are bringing their Count Rockula Tour to Australia in October. This will be the band’s first visit back to Australia since early 2015 and their first ever headline tour. Loved, hated, ridiculed, admired, Falling In Reverse frontman Ronnie Radke is a rare rock n’ roll provocateur whose unpredictability and reckless honesty make him equal parts hero and villain, depending on whom you ask. Radke puts it all on the line, take it or leave it, each and every time he and his band do anything. In 2014, only Motörhead legend Lemmy edged out Radke on Kerrang!’s list of the 50 Greatest Living Rockstars in the World, a line-up that included the likes of Slash, Steven Tyler and Ozzy Osbourne.